Robert Beatty has created a compelling sequel that more than lives up to the first book. The action takes off in the first chapter and never really lets up (although Serafina has a few quieter moments they are few and far between). Just as Serafina is coming to terms with her shapeshifting abilities and is trying to figure out where she belongs: Biltmore or the forest. While wandering the forest one night she observes a strange carriage pulled by four wildlike stallion that drops off a strange man and his wolfhounds. She nearly dies when the wolfhounds attack her. Only with the help of her catamount mother and a feral boy does she manage to escape and return to Biltmore. But she is left with concerns about the person in the carriage that she didn´t see that is now at Biltmore intending harm. 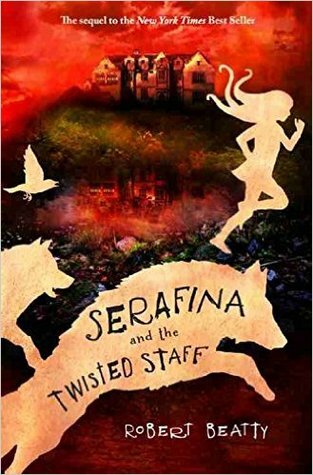 But an awful series of events sends Serafina fleeing into the forest where she discovers that things are even worse than she thought. Only by finding a way to harness her own abilities and rallying her friends to her side can she find a way to defeat the evil that seeks to take over the whole region. The strange behavior of the animals complicates things as does the arrival of a Detective seeking to investigate the disappearance of Mr. Thorne (see book 1). I found the book compelling and fascinating with lots of twists and turns, especially at the end. This is the sort of book that I love to hand to children who like scary/suspenseful stories that are well told and don´t follow overdone tropes. The underlying themes of the choices people make, and finding oneś way to peace within and well done and not overly preachy at all. Serafinaś efforts to protect the people and places she loves shines through loud and clear, but her struggles with fear and shame feel very real. A great sequel that I will hand to students with great pleasure.